We just released version 2.0 of WP Security Audit Log plugin. It has been a long wait, a bit more than two months but the wait is worth. In this new version we introduce an all new WordPress database connector, two other new features and bug fixes as explained in these highlights. 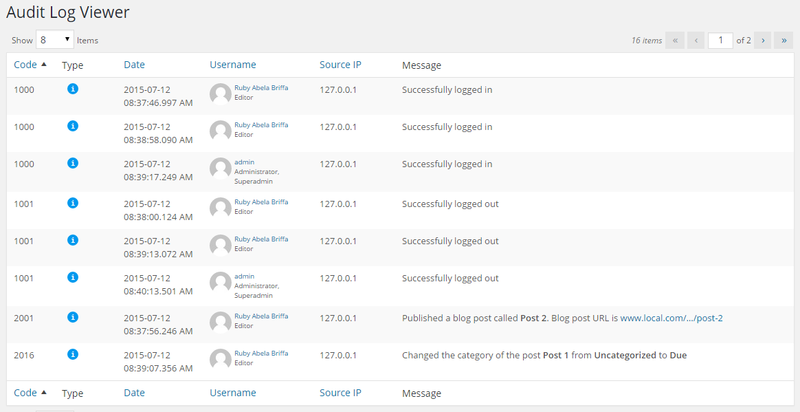 In this version of WP Security Audit Log, the plugin that allows you to monitor WordPress users and their productivity, we built a new database connector that allows faster and more efficient plugin to WordPress database communication. The new WordPress database connector will also allow us to add much more new features through the add-ons, such as support for an external database. In fact at the moment we are working on a new premium add-on that will allow you to save the WordPress Audit Log, to an external database. By hosting the audit log of your WordPress in another database you improve the security of your WordPress, reduce the chances of having the audit log tampered and as well improve the website’s performance. It is now possible to select the time format reported for each alert from the plugin’s settings page. Therefore the time stamp for each alert can be displayed or in 24 hours format or in 12 hours format (AM / PM) as seen in the below screenshots. In this version it is also possible to sort the logs in the Audit Log viewer by Code, Date & Time and Source IP address. To sort the logs click on the column’s title in the audit log viewer. In the below screenshot the logs are sorted by Alert Code. Fixed an issue where the role of a Super Administrator was not reported when it was logged in to a site on the WordPress multisite network. Fixed an issue where a user tried to change the password from the profile page and alert 4003 was generated even though the password confirmation failed. Fixed an issue where a WordPress administrator tried to change a WordPress user’s password and alert 4004 was generated even though the password confirmation failed. Fixed some formatting / display issues in the Audit Log Viewer (such as spacing and wrapping of text in Date & Time column). Fixed an issue where multiple plugins were updated at the same time using the Update option in the drop down menu and no alert was being generated. Version 2.0 of WP Security Audit Log plugin can be installed from inside your WordPress admin by navigating to the Updates page under your Dashboard menu. Before installing this update, or any other update we recommend you to make a complete backup of your WordPress. We use BlogVault online WordPress backup service to backup our website.